Our Detective Survey addresses both, physical loss of bunkers and fuel consumption optimization. Find undeclared hidden bunkers, identify tampering of sounding pipes, magiv pipes, & concearled spaces. Fuel efficiency analysis and optimization of vessel performance and efficiency. Implementing programs that increase ship’s fuel efficiency and optimise vessel performance have become increasingly popular. Bunker fuel being the biggest part of their expense, shipping companies are investing large sums in systems that promise increased voyage returns. From our analysis of data gathered over last years, we have seen that while increasing fuel efficiency is vital, its impact on the overall voyage return can be rather small unless efficient methods of curbing loss of fuel that is not actually consumed in the engines are implemented. Bunkers are typically the largest contributor to the operational cost of a ship, with the physical transfer of fuel taking place thousands of miles away from the contracting offices. As neither the buyer nor the seller is present to witness the bunker quantity transfer and sampling procedures onboard, any post- delivery investigation on quantity shortage or sampling dispute is usually futile and inconclusive. Physical shortage, protest, demurrage, legal fees, management time and loss of good will inconvenience and stress all parties involved and add to the overall costs. Responding to these concerns, BS pioneered an impartial and independent BQS service in 1987 and has completed more than 80,000 BQS worldwide. BS is the first company to implement a worldwide Code of Practice with regular on the job quality assurance audit to ensure the highest level of integrity and service performance. The custody of bunker fuel onboard a vessel is transferred from the Owner to the Charterer when the vessel’s charter begins and it goes back to the Owner when the charter ends. Since bunker is an expensive product, it is important to establish the exact quantity of onboard when the charter begins and again when it ends. This Bunker ROB (remaining on board) survey when done at the beginning of a charter is called the ON Hire ROB Survey and at the end of a charter is called the OFF Hire ROB Survey. Any excess between the OFF hire quantity and the ON hire quantity is payable by the Owner to the Charterer just like any shortfall is payable by the Charterer to the Owner. Obviously, a Charterer would like to see a lesser quantity at ON hire and more at OFF hire while the Owner will want it the other way. A surveyor is appointed to gauge the tanks independently. Hence it is vital that he establishes the actual quantity onboard, be it an ON Hire or OFF Hire survey. He must therefore physically gauge all tanks onboard, ensure correctness in his gauging (record tank reference heights and compare them with the calibration tables), physically check each tanks temperature and carefully apply the correction factors when calculating the quantity. 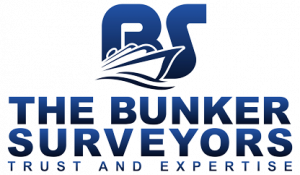 Many Charterers often request for a thorough Bunker Detective Survey at the time of OFF Hire. Charterers or Owners also often request for a Vessel Condition Survey at the time of On or Off hire ROB survey for recording the vessel’s condition at the commencement or end of the charter. This is to establish the exact quantity of all fuel on board the vessel. The appointed Surveyor will therefore physically measure and take temperatures of all fuel tanks on board and ensure the tank reference heights are correct by comparing them with the calibration tables. The Surveyor will also compare the measured quantities with the declared logbook and arrival (FWE) figures from the vessel. ROB Certificate with all quantities will be issued. This is to establish the exact quantity of sludge discharged from the vessel to a bunker tanker or truck. The appointed Surveyor will therefore physically measure all sludge related tanks before and after discharge and the bunker tanker or truck before and after receiving the sludge. The Surveyor will also record the fuel consumption data in combination with the amount of sludge produced on board since the last sludge disposal, so percentage of sludge against fuel consumed can be calculated and mentioned in the final report.